Prepared to Deal With Pepper Plant Diseases? Pepper plant diseases occur rarely. However, it's important to monitor your plants and catch any problems early on, before serious damage is inflicted. Blossom end rot is one of the more common pepper plant diseases. It is caused by a lack of calcium. This problem is easy to diagnose because the bottom of the fruit will have a black spot and appear to be rotting the inside of the pepper. It might look like there is a black hole in the bottom of the fruit. This problem can be solved by watering your plants more thoroughly so that the calcium in the soil can be absorbed by the roots and transferred to the plant. However, some soils are just inherently calcium deficient. This problem can be easily solved by sprinkling lime around the base of the plant and watering it in well. Lime is available at most major garden centers. It is basically just limestone that has been crushed into a fine granular material. Lime contains a high concentration of calcium. Once you've added calcium to the soil, your blossom end rot problem should be solved and you can expect nicely formed fruit in the future. Other diseases involve fungal infections. If the fruit is cracked or has a thin film of dust on it, you're definitely dealing with a fungal problem. Additionally, you may see dark spots on the leaves or branches. This can be solved by using a fungicide that can be purchased in most garden centers. Also be sure not to water the tops of the plants. Wet foliage will encourage fungal problems to develop. We have implemented a preventative fungicide spray program in our own garden, with good results. We mix together 2 gallons water, 4 tablespoons baking soda and 4 tablespoon hydrogen peroxide in a 2 gallon pressure sprayer. We shake it up well and then spray it all over our pepper plants every 10 days or so, or after every heavy rainfall. If we still end up with a fungal problem (and we rarely do), we switch to a commercial product. 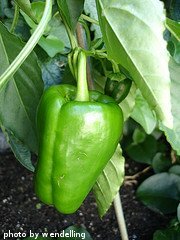 If your pepper plants are producing soft, mushy fruit, you are watering too much. Cut back on your watering and let the plants dry out a bit. This will encourage fruit to be more firm in the future. Other pepper plant problems are caused by insects. You might observe aphids on the underside of the leaves. You also may notice insect "trails" on the leaves or even holes in the leaves themselves. All of these symptoms indicate an insect problem. Choose a good insecticide and apply according to the manufacturer's directions. In our garden, we utilize a homemade soap spray. We mix together 2 gallons water, 4 tablespoons liquid dish soap and 4 tablespoons hot sauce (the hotter the better) in a 2 gallon pressure sprayer. We shake it up and then spray it all over our pepper plants every 10 days or after every heavy rainfall. This mixture works well as a preventative measure. It doesn't actually kill anything, but it does encourage bad insects to move elsewhere. If we still end up with a pest problem, we switch to a commercial pesticide product. There are many types of pepper plant diseases than can affect the stems, leaves and fruit. 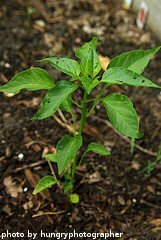 Most hybrid types of pepper plants have been bred to be disease resistant. Proper fertilization, watering, plant support and crop rotation will prevent the development of many of these diseases.